Highly pure (> 98%) E.Coli derived recombinant Human IL-15 (Cat.-No PA088). Centrifuge vial prior to opening! Direct ELISA: To detect hIL-15 by Direct ELISA (using 100 µl/well antibody solution) this antibody can be used at a concentration of 0.25-1.0 µg/ml. Used in conjunction with compatible secondary reagents, allows the detection of at least 0.2 ng/well of recombinant hIL-15. Sandwich ELISA: To detect hIL-15 by Sandwich ELISA (using 100 μl/well antibody solution) a concentration of 0.25–1.0 μg/ml of this antibody is required. This Biotinylated polyclonal antibody, in conjunction with purified Anti-Human IL-15 (Cat.-No PP1035P) as a capture antibody, allows the detection of at least 0.2-0.4 ng/well of recombinant hIL-15. Western Blot: To detect hIL-15 by Western Blot analysis this antibody can be used at a concentration of 0.1-0.2 µg/ml. Used in conjunction with compatible secondary reagents the detection limit for recombinant hIL-15 is 1.5-3.0 ng/lane, under either reducing or non-reducing conditions. PBS, pH 7.2 without preservatives. Restore in sterile PBS containing 0.1% BSA to a concentration of 0.1-1.0 mg/ml. 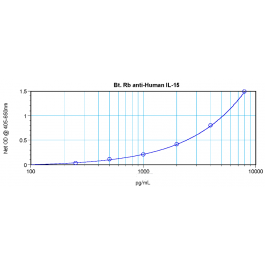 This antibody reacts with Human Interleukin-15. Other species not tested.